Seeing 'Wreck-It Ralph' in the cinema recently was worthwhile not only for its excellent use of 3D in action sequences but also its preceding animated short film, 'Paperman'. It made its way online, thanks to the good people at Disney, before disappearing again. But having won the Oscar for Best Animated Short last month, it has thankfully returned - watch below. The magical short is the directorial debut for John Kahrs, who was one of the animators on 'Ratatouille' and 'Tangled'. The story sees two New Yorkers bump into each other on their morning commute, parting without a word said - unexpectedly, they find they work across the street from one another, and the man tries desperately to attract the attention of his love interest. With paper airplanes, of all things. 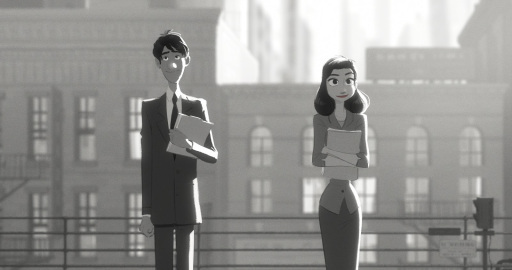 'Paperman' feels retro in its style (mostly black-and-white, no dialogue) and setting yet mixes hand-drawn animation with cutting edge CG. The story itself is fairly simplistic but the animated style combined with the sweeping score elevates 'Paperman' into something altogether more magical. Perhaps it would have been even more special with just the one word said at its finale - "Hello."